Tender leaves, flowers, and green pods are eaten boiled or steamed. Beta-carotene: high in leaves; vitamin E: medium; riboflavin: high; ascorbic acid: extremely high; calcium: medium; iron: medium; protein: 5.2%. 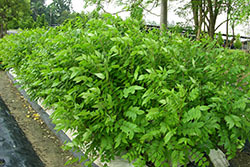 Leaves contain aromatic, yellow anthraquinones that tend to have laxative effects.